The first member of the UZ engine family is 1UZ-FE. It was a 4.0-litre V8 gasoline engine offered for luxury and sports cars of Toyota and Lexus since 1989 to 2002 and when replaced with the 3UZ-FE engine. In turn, the 1UZ engine replaced the outdated Toyota’s V family engines, which were used from the 1960s through the 1990s. The 1UZ-FE engine has aluminum cylinder block with thin cast-iron cylinder liners. The engine block has a 90-degree angle between the cylinder banks. The cylinder banks are displaced relative to each other by 21 mm. The engine has six main bearing and a forged steel crankshaft with eight balance weights. For reduction of rotation masses the engine was equipped with lightweight and robust forged steel connecting rods, aluminum pistons, and connecting rod pins that were induction-hardened. In late 1994, the 1UZ-FE received an even lighter crankshaft and lighter connecting rods, shorter and thinner piston pins, and modified pistons. The engine is well known for quiet and smooth operation. The great merit in this is the applying of liquid-filled compound engine mounts. In 1997 the engine got upgrades, and one of those was the increased rigidity of the cylinder block which is good for quieter operation. The design of the 1UZ engine is more common for a racing engine than an ordinary engine for a road vehicle. There are more expensive eight counterweight crankshaft, lightweight components, and almost square dimensions of bore and stroke. But the most recognizable feature is the DOHC 32-valve aluminum cylinder heads. Back in a day, an ordinary V8 engine has a single camshaft in a cylinder block, and OHV heads with two valves per cylinder. The 1UZ-FE has two camshafts (intake and exhaust) and four valves per cylinder in each cylinder head. The intake camshafts only are driven by a timing belt, and the exhaust camshafts are driven by gears on the intake camshaft. The engine heads don’t have hydraulic lifters. There are solid aluminum alloy valve lifters and steel outer shim type valve adjusters on top of them. The valve stem diameter is 6.0 mm for both exhaust and intake valves. Intake valve diameter – 33.5 mm, exhaust valve diameter – 28.0 mm. However in late 1997, the diameter of valves was increased (intake valve – 34.5 mm; exhaust valve – 29.0 mm;), while the stem diameter was reduced to 5.5 mm. The original 1UZ-FE had the simple ignition system which includes two distributors and two ignition coils. Also, the 1UZ-FE engine had multi-port fuel injection (MFI) until 1994 and then switched to sequential multiport fuel injection (SFI). The Non-VVT-i engine had mechanical throttle body and its aluminum intake manifold. The engine had EGR system (Exhaust Gas Recirculation) to bring some amount gases back inside the cylinders. The recirculation gases were cooled by coolant at the back of the engine. The EGR was removed in 1997. The exhaust system consisted of stainless steel headers and monolithic type three-way catalytic converters. As was mentioned before 1997 was the time of significant changes. Among other innovations described earlier, the 1UZ-FE engine was equipped with Variable Valve Timing system or VVT-I (I – intelligent). The throttle body now is controlled electronically and the all system got its name ETCS-I (Electronic Throttle Control System – intelligent). This system allowed managing of the idle speed, cruise control, and Vehicle Skid Control system. The engine came with the new intake manifold. It had long ports and was designed to increase torque at low to mid engine rpm. The active port’s length of the intake manifold became varied by Acoustic Control Induction System (ACIS). This system uses a bulkhead to divide the length range into two stages. The engines from 1997 had the higher compression ratio 10.5:1 and steel laminate type gaskets between cylinder heads and engine block. The 1UZ-FE VVT-I had a lot of small external and internal changes engineered to increase reliability, rigidity, performance, to reduce friction and power losses, fuel consumption and emissions. 5.1 (0.3 - oil filter) - 1994+ models. 9,000 (15,000 km) or 12 month - 1994+ models. Somebody say it will last forever, but truthfully 300,000 miles is a significant number. There are not so many engines went far than that. But still, the 1UZ’s longevity is utterly impressive. With proper maintenance, it doesn’t knock, leak or burn a single drop of oil. 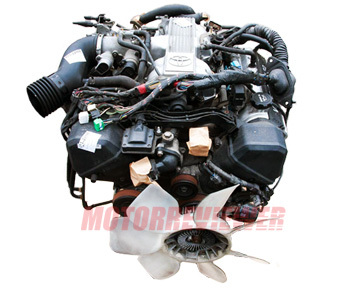 For big mileage cars, it is common problems with external engine components such as water pump, alternator, and starter. The last one is required so much work just to take it off. The spark plugs are sensitive to a fuel quality. Don’t use a poor fuel otherwise, it will lead to expensive spark plug replacing very soon (it is expensive due to a no-easy and time consuming replacing process for this engine). The second gen 1UZ (late 1994+) and VVT-I engines can suffer severe damage if the timing belt breaks. Keep an eye on timing belt condition and change it according to the Toyota’s maintenance schedule. Also, the first gen 1UZ-FE is a little bit over-engineered and has beefier and stronger pistons, connecting rods, etc. In this case, they produce less power but have more strength, durability, and smoothness inherent for luxury cars.